Melt butter in a saucepan. Add chips and stir until melted. Add melted mixture to cocoa in a bowl and combine. Set aside. In a separate bowl, whip eggs with brown sugar. Mix flour with baking powder and salt. Add this dry mixture to egg/ brown sugar mixture. Mix in the butter/chips/cocoa combination. Stir in additional chocolate chips and nuts. (Some nuts and chocolate chips may be saved to sprinkle on top of the brownies before baking.) Spread batter into a greased 9 x 13-inch pan and bake for 25 minutes in a preheated 350 degree F oven. Cool before slicing. 1. Pre-heat oven to 325 degrees. Cream butter and sugar in a large bowl. Add eggs and vanilla and stir until combined. Sift baking powder and salt with 1 cup of flour. Pour into the butter mixture and then thoroughly stir in the rest of the flour. Add chocolate chips to mixture and stir in gently. 2. Grease a 13×9 pan and lightly dust with flour. Press dough into pan with flour on your hands. Bake for 25-35 minutes or until lightly browned. Preheat oven to 350°F. Grease and flour 13 x 9-inch baking pan. Combine cake mix, eggs and butter in large bowl with wooden spoon until blended. Stir in chips and pecans. Pour into prepared pan. Bake 25 minutes or until toothpick inserted in center comes out clean. Do not over bake. Cool completely on wire rack. Cut into bars. Line a 9-inch x 13-inch baking pan with foil and spray the foil with nonstick cooking spray. With an electric mixer with a paddle attachment, cream 1 cup butter with both sugars and the eggs. In a large bowl, mix the flour, baking soda, salt and oats and add slowly to the creamed mixture. Spread three-quarters of the batter into the prepared pan (I wet my clean hands with water to press down the dough evenly). Reserve the remainder of dough for the topping. Combine the condensed milk, chocolate chips, the remaining 1/2 cup of butter and vanilla in a microwave safe bowl and melt in the microwave, stirring often to prevent scorching. Stir until smooth and pour chocolate mixture over dough in pan. Drop the remainder of the oats dough by spoonfuls on top – press down slightly. Bake for 22-28 minutes, or until a toorhpick comes out with very few moist crumbs. Let cool completely before cutting and serving. Sometimes I just post things on here that make me happy. 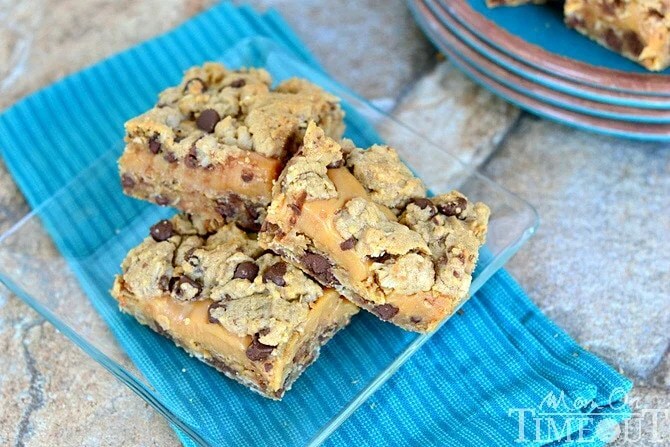 Does that mean that if you eat these no bake bars you will feel like dancing? Maybe. Line a 9″x9″ pan with foil. Spray foil lightly with non-stick spray. Melt the peanut butter and honey together until smooth, either in the microwave or stove top. Combine mixture with oats. Press into prepared pan. Place pan in refrigerator until set. 1. Preheat oven to 350 degrees. Spray bottom and sides of 13×9 inch pan with cooking spray. 2. Pour sugar cookie mix in a big bowl. Cut in butter until mixture is crumbly and coarse. Set aside 1 1/2 cups of mix for later (topping) and press the remaining crumbs in the bottom of the 13×9 pan. Bake for 10 minutes; do not over bake. 3. Put cream cheese, sugar, flour, vanilla, and egg in a large bowl. Beat together with an electric mixer (medium speed) until smooth. 4. Spread cream cheese mix evenly over crust. Spoon raspberry pie filling over the cream cheese; spread evenly. Take remaining 1 1/2 cups of unbaked crumbs and sprinkle over the top. 5. Bake 35-40 minutes or until crumbs on top are lightly golden brown. Cool 30 minutes, refrigerate about 2 hours to chill. 6. Cut into bars. Store covered in fridge. Makes 24 bars. * Can easily substitute cherry or strawberry fillings. Original site source, click here. Thank you to my friend Julie, who shared this recipe with me. Unwrap caramels and place in a small saucepan with butter and sweetened condensed milk. Cream butter and sugar together in a large mixing bowl. Add peanut butter and continue mixing. Add eggs one at a time, mixing well after each egg. Add in vanilla. Combine flour, oats, baking powder, and salt in a small mixing bowl. Add the flour mixture slowly stirring until well combined. Spread ⅔ of the dough on the bottom of the pan. Slowly pour caramel mixture evenly over the dough. Drop the remaining dough on top by the teaspoon. Bake for about 30 minutes. Let cool completely and then cut into bars. In addition to keeping the cake from sticking to the pan, lining the pan with foil makes it easy to lift it out after baking. If you can’t find pumpkin-pie spice, substitute 1 1/2 teaspoons cinnamon, 3/4 teaspoon ginger, 1/2 teaspoon nutmeg, and 1/2 teaspoon each allspice and cloves (all ground). Preheat oven to 350 degrees. Line bottom and sides of a 9-by-13-inch baking pan with foil, leaving an overhang on all sides. In a medium bowl, whisk together flour, pie spice, baking soda, and salt; set aside. Spread batter evenly in prepared pan. Bake until edges begin to pull away from sides of pan and a toothpick inserted in center comes out with just a few moist crumbs attached, 35 to 40 minutes. Cool completely in pan. Lift cake from pan (using foil as an aid). Peel off foil, and use a serrated knife to cut into 24 squares. Melt 1 cup morsels and butter in large, heavy-duty saucepan over low heat, stirring constantly until smooth. Remove from heat; stir in eggs. Add flour, sugar, baking soda and vanilla extract; stir well. Spread batter into prepared baking pan; sprinkle with remaining morsels and walnuts. Bake for 20 to 25 minutes or until wooden pick inserted in center comes out slightly sticky. Microwave caramels and milk in small, microwave-safe bowl on high (100%) power for 1 minute; stir. Microwave at additional 10- to 15-second intervals, stirring until melted. Drizzle over warm brownies. Cool in pan on wire rack. Line a 9×9-inch pan with foil and coat with cooking spray. Place 16 peanut butter cups in an even layer on the bottom of the pan. Place chocolate chips and sweetened condensed milk in a medium saucepan over low heat. Stir until chips and milk melt together. Once everything is melted, spread evenly over peanut butter cups in prepared pan. Crumble remaining Reese’s Peanut Butter Cups and sprinkle over the top, pressing them lightly into the fudge. Cool on counter-top until fudge reaches room temperature, then cover with plastic wrap and place in the refrigerator to harden completely. Cut into squares and serve. Makes 32 bite-sized servings.